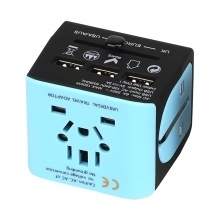 This universal travel adapter has 3 USB ports, 4 multi-standard plugs and a multipurpose socket. The plugs and socket support for US, EU, UK and AU standard, suitable for most countries. You can always find suitable socket no matter where you are. And it is very easy to use multinational plug with a switch push button. It is very safe to charge because there are overcurrent, overvoltage and short circuit protection. Plus, the exquisite and delicate shape will bring you great use experience. Believe you will need this adapter for travel and daily life. * With 3 USB ports and 5V 3A max current, you can charge 3 devices simultaneously, 3A current brings fast charging speed. * Support for US, EU, UK and AU standard, suitable for most countries. You can always find suitable socket no matter where you are. * With a multipurpose socket and four multinational plugs. There is a plug switch push button, which is very easy to switch among different plug standard. * With overcurrent, overvoltage and short circuit protection, make your charging safe. * Exquisite shape and delicate texture bring you great use experience. Portable design is especially suitable for travel. Note1: Only suitable for safe use in areas below 2000m altitude. Note2: Do not use it outdoors. Note3: This adapter is only used for different national standard plugs to convert each other, do not have the voltage change function, please confirm your electrical appliance applies the rated voltage/current indicated above. Note4: The EU standard plug is applicable in Germany, Belgium, Spain, Holland, Switzerland, Brazil, etc. The US standard plug is applicable in USA, Canada, Mexico, Japan, Thailand, etc. The AU standard plug is applicable in Australia, New Zealand, Fiji, etc. The UK standard plug is applicable in UK, Singapore, China, Hong Kong, Malaysia, Dubai, Philippines, etc. USB Output: DC 5V, 3A Max.